It all started with shame. I was ashamed of who I was. No, I wasn’t a terrible person and I never endured much of what other women have that evokes shame. But I wasn’t super smart or super pretty or super athletic or super funny. I was simply plain, run-of-the-mill average. And I was ashamed. 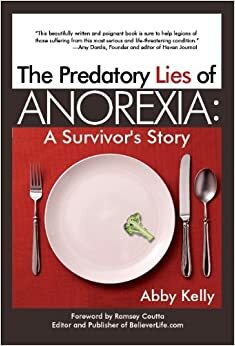 For fourteen years, anorexia allowed me to excel at something. No one wanted to compete with me, but I competed with everyone. In my malnourished mind, I “won” every time I was thinner than another girl, every time I turned down food that another person simply couldn’t resist, every time I went for a long run in the rain while others pulled the sheets over their head and enjoyed the warmth of a cozy bed. I was an excellent anorexic. Finally, I surrendered. I quit trying to make myself into someone I could be proud of—someone with a strong self will, a perfect figure and uncompromising strength. I finally relinquished the my pursuit of “excellence”. But then, shame reared its ugly head again; this time, he had a double-edged sword. You’re still average—average weight, average strength, normal temptations. Did you just have seconds? You’re pathetic. I can’t believe how much of your parents’ money you wasted. It’s shameful the emotional toll your behavior took on your sisters and friends. I can’t believe you call yourself a Christian and you couldn’t even summon the faith to get “healthy” in less than 14 years. You’ll always be pathetic. Henry Cloud says that shame has three characteristics that distinguish it from God’s gentle correcting voice. He says shame is always personal, permanent and pervasive. Pervasive. It’s shameful the emotional toll your behavior took on your family and friends. I can’t believe you call yourself a Christian. The enemy’s accusation encompassed my whole life, my faith and all of my relationships. However, Colossians 3:3 says, “For you died, and your life is now hidden with Christ in God.” If sin and shame pervaded my life before, they do no longer because I have Christ’s life. Permanent. You’ll always be pathetic. But the Bible says in 2 Corinthians 5:17 “…anyone who belongs to Christ has become a new person. The old life is gone; a new life has begun!” No sin or mistake is permanent. God holds nothing against me.